Log grapples and hydraulic forks for general forestry applications. Idrobenne offers a complete range of grapples for truck cranes, hydraulic wheeled loaders and excavators. Logging grapples are gripping devices with two synchro-mesh jaws, operated by one double-acting hydraulic cylinder, with only one hydraulic circuit. Motion of the equipment is caused by the driving of the operating machine on which the grab is mounted. The cylinder is equipped with a safety valve to prevent the accidental opening of the clamp in case of a sudden pressure drops. 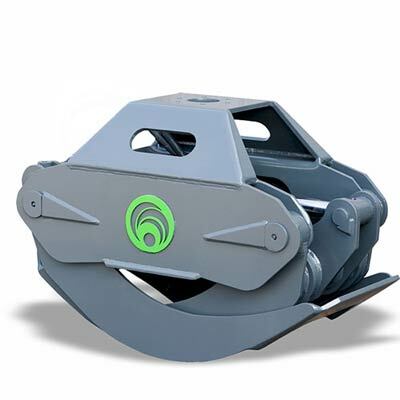 The arms of Idrobenne log grapples have an optimized curvature, designed to guarantee the maximum load. The arms close one inside the other, allowing a firm grip even on logs of very small diameter. In fact they are perfectly suited to handle even single trunks. Excavator grapples are often provided of an hydraulic rotator, a very common accessory which can orientate the clamp and make the handling of long wood very easy. Timber grapples are suitable to handle logs, three branches, wooden sleepers and similar materials. Idrobenne offers two lines of hydraulic grapples: a light series, which is more economical and intended for non-intensive applications, and a HD series for industrial forestry. Logging grapples of the first type are called PTO range. These devices are set in motion by a horizontal cylinder which is pivoted in a simple and light structure, which makes it an inexpensive and versatile accessory. The PTO clamps are the best option for mini excavators, agricultural loaders and small truck cranes. They are aimed at gardeners, farmers, small businesses and individuals. The constructive geometry provides for a single synchronization rod which coordinates the movement of the arms. Each junction is made with hardened steel bushings with internal spiral for grease distribution. All pins are plated and generously dimensioned. Construction material is high-tensile Swedish steel made by SSAB, which is considered the peak of quality in worldwide production. These log grapples can be made with free tips, bladeless. In this configuration, the PTO hydraulic clamps are ideal for feeding chipper machines. Idrobenne PTO line is arguably more robust and efficient than no-European products, which today can be found on generalist websites at very low prices. But, as we always say, cheap quality does not exist. Log grapples of PTO/S line are placed at the top of the range of this type of accessories; they compete for quality and performance with brands like Hultdins Supergrip, Cranab and hsp Gripen. 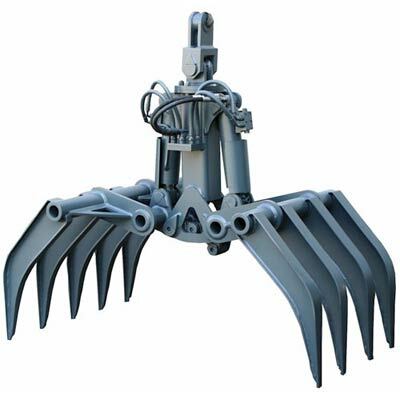 These hydraulic accessories are intended for professional and demanding customers, for industrial forestry uses. They have a very modern and sturdy design, similar to the Swedish grapples, with a central cylinder and two connecting rods at its sides. A constructive geometry that ensures the perfect distribution of force and which gives the best reliability. The PTO/S grapples are built with high quality DOMEX 690 steel and with an incredible attention to construction details. 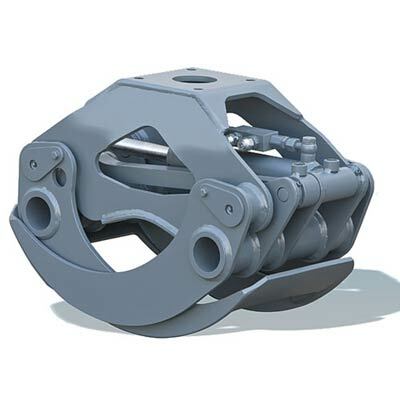 These logging grapple can equip cranes, excavators and material handlers up to 26 Tons weight. Timber grapples must be mounted on the operating machine through a cardan suspension link, like it happens for clamshell buckets and orange peel grapples. Idrobenne is able to build tailored-made suspension brackets for any excavator or hydraulic crane. A comprehensive range of accessories is made available, like a flanged, bolt-on fixed head, and a free mechanical rotator, which can turn freely for 250°. But the main accessory is undoubtedly the hydraulic rotator, which allows the operator to turn the log grapples very precisely during loading and handling. Hydraulic rotators offered by Idrobenne are built by German company Kinshofer, a very well-known brand. Kinshofer hydraulic rotators are driven by a mechanism of concentric gears, called orbital system, which is protected by two tapered roller bearings. These rotary engines, although not cheap, are recognized by customers as products with an excellent quality / price ratio. Idrobenne can also provide rotators with vane motor, made by Indexator and Intermercato. Logging grapples are very versatile, being able to equip all hydraulic machines and forestry cranes. Given the reliability of the materials, the very proven design and the precise assembly under ISO 9001 quality rules, Idrobenne’s excavator grapples are available in the used market. Idrobenne often provides logging grapple for used excavators. Pre-owned log grabs are often available on various websites like e-bay, etc. Used grapples are sometimes overhauled with warranty and available from the Isorella warehouse. Idrobenne hydraulic equipment can result from short rental terms and maintain a good condition. 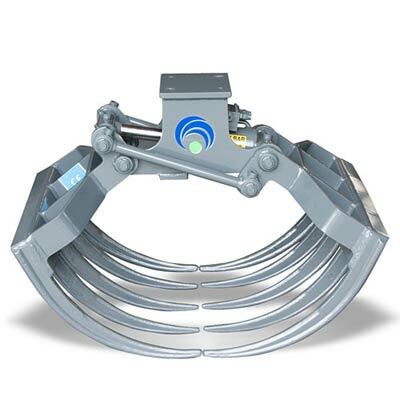 The prices of hydraulic grabs and their accessories are very competitive in terms of sturdiness and reliability. The company offers a comprehensive after sale service and spare parts; it offers log grapples for mini excavator at low prices.